I think we all have those days where we wake up and lack the effort or energy to put a full face of makeup on. I love wearing simple, everyday makeup when I do not have anywhere important to be so today I thought I would share with you one of the most quick and easy ways to achieve warmth and glow on the skin. Today I am going to review a product from theBalm. 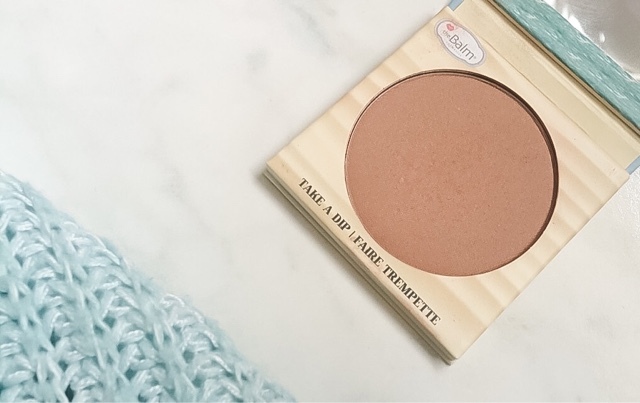 The Balm Desert Bronzer is marketed as an all in one, bronzer and blusher. This is a soft red toned bronzer which doubles up as a blush when lightly applied over the cheeks. As you can see from the swatches pictured above, the harsh swatch appears very matte and harsh on the skin which is great for adding more depth on the temples and cheeks. However, the blended swatch appears more luminous and dewy with a slight gold sheen to it which is great for lightly dusting on the apples of the cheeks to add a slight glow to the skin without having to apply blusher or highlighter. Unlike most bronzers, this product only comes in one universal shade. It is very red toned in comparison to a lot of other bronzers which I love because it appears more natural on the skin rather than looking orange. The bronzer when applied is very pigmented so I found that lightly tapping my brush into the powder and then tapping off the excess ensured the application was smooth. I personally think this shade is very universal and will suit the majority of skin tones, however I feel that if you are exceptionally pale this may look slightly muddy however if you have a tanned complexion or around the same skin tone as myself then I think you will love the way this looks on the skin. I personally tend to opt for matte bronzers because I find them to apply and sit better on the skin. However, whilst this bronzer has a slight shimmery sheen running through the powder, I do not find it to feel gritty or chunky. The consistency of this powder is very finely milled which makes application a dream. Overall, I think this bronzer is amazing for anyone with light-medium skin tones who likes to apply makeup quickly. This product can be purchased from the BeautySpin website for £12.90! I didn't realise how affordable this bronzer was, I'm going to stick it on my wishlist! This is a really pretty bronzer. I'm warm toned, so I think it will be perfect. Really love the lay out and the content of your blog, you're doing a really good job. Thank you so much, that's so lovely!